Our SR5 is now well designed. The paddle shift has worked very well but our gearbox was too short. The race started well, but after only 20min, we bumped into a Porsche (see picture). After some repairs, the car went back onto the track to do 2 relays of 1h40. 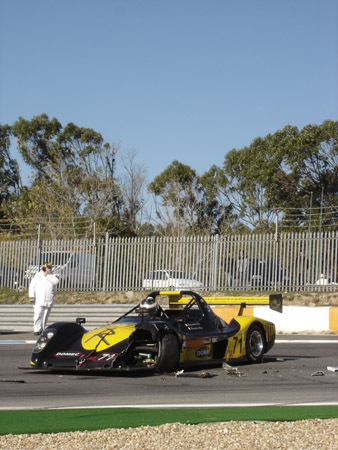 The race was stopped by red flag, 1h30 before the scheduled finishing time as the organisation ran out of petrol. We would like to remind you that our SR5 is still not rented for 2008 season Vdev or Radical World Cup. 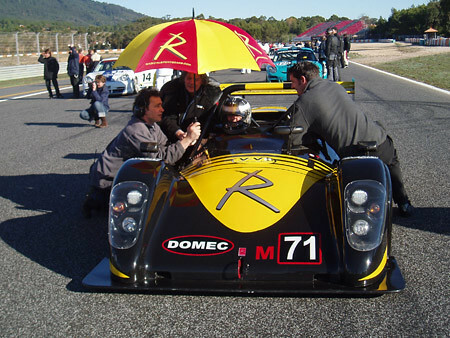 It’s done : Our Radical SR3 2006 is sold. After an excellente season, it should make the new owner very happy in a few days. To replace it, we have purchased a new SR3 2008 (1500cc), with light weighted bodywork. Power, suspension and braking should allow our car to reach the CN cars performances. This car is already booked for the 2008 season in Vdev championship. We will release pictures as soon as we receive the car.